Hi everyone, today we’re talking to Danny Robinson, the CEO of Perch. Perch is a great tool that helps you connect offices and remote workers to bring everyone in your company closer as a team. Danny’s got some interesting insights into customer service, creating a great product, and talks about how they’ve been able to keep churn at 0% for at least four months. 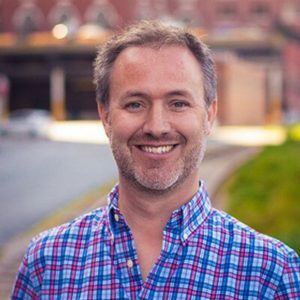 Danny’s been working as a tech entrepreneur for the past 15 years, during which he started four internet companies, a tech accelerator, and a government organization focused on helping entrepreneurs and startups. Perch, his latest company, is an always-on video window (set up via an iPad) that connects work spaces to help remote teams feel more connected to each other so companies can have a stronger corporate culture. They’re tapping into the trend of helping people feel like they’re there with their team even when they aren’t… and helps subside the fear of missing out. In the past month, says Danny, they’ve more than doubled their number of companies they serve, and are pushing up to 400 companies using Perch on a daily basis. It’s taken a lot of techniques to get to that point – but mostly word of mouth. Sometimes, people can be resistant to using a tool like Perch, for a number of reasons – including the creepy big brother feeling they’d rather not deal with. There’s no way someone would be able to eavesdrop on conversations, and your microphone is off unless you’re looking directly at the app. When you walk away, the app automatically mutes. They play audio cues when someone arrives. So no one can sneak up on you… every time someone shows up on Perch, there’s an audio cue (non-distracting) that plays through the whole room so you’re aware that someone’s there. When the app is running, the iPad’s rear camera is not allowed to activate, so you’re not able to spy on anyone. The app always and only works on two-way video. There’s never one-way video. Installed on a team wall or near the water cooler. Only a few people use Perch directly on their desk. Most office spaces post it on the wall as a sort of extension of the working space… or near the water cooler so employees (even in different cities) can build rapport and have small talk conversations with each other throughout the day. There’s lots of cool in-company success stories… some Danny’s allowed to talk about and some not. They service cool workplaces like TripAdvisor and Slack, who use Perch in their kitchens. Danny says they do a lot of heads-down iteration on their product and the user experience. They make sure they cover all the bases to make people feel connected to their team, while keeping their privacy in their control. It’s a tough thing to balance out, but Danny says he feels like they’ve really nailed it in the past few months. Getting publicity hasn’t hurt, either. Noah Kagan of AppSumo lists it in his top 10 tools, and mentioned Perch on the Tim Ferriss podcast… which generated quite a bit of traffic for them. Another bit of press came from Gartner, who name them one of their top five cool vendors, without any payment or solicitation from Perch. A lot of companies pay tens of thousands of dollars to PR firms to get Gartner to mention them in anything, but since Perch is the only company in the market doing the kind of work they do, Gartner considers them the only company in that space that they know of. Unfortunately, traffic coming in to an iOS app isn’t always easy to track, so it’s hard for them to tell exactly how much success to allot to their publicity in contrast to their own marketing efforts. One thing Perch likes to do is to pick a cross-section of companies that either absolutely love and adore their product or are having some problems with it. They take a few companies from each of these groups and over-service them to really understand how they use the app, which makes the data they gather much more real, believable, repeatable, and scalable. Over the last few months that they’ve been doing it, they’ve been able to better tell what people want to get out of the app and how to deliver it. Over-servicing involves doing direct, never automated emails, getting on Perch with them, having in-person face-to-face conversations, or sending small gifts as a way of saying thanks. According to Danny, the tech scene in Vancouver (where Perch is based) is very small, just like any other non-valley suburb. But, though it’s small, it is very vibrant with a lot of people starting a lot of great companies. People choose Vancouver a lot for lifestyle reasons, and it’s part of why Perch is built – to be able to be remote without having the downsides of remote teams. Danny advises that to find a mentor, attend every event you get invited to, talk to people, and be as extroverted as possible… and to constantly pitch your idea until you find people who really like it. Sometimes mentors give good advice, he says, but the real value comes with the credibility you get by being associated with them. For example, if you’ve got a high-end person on your advisory board, you carry a lot of weight when you get the opportunity to say so. Danny says they’re still facing a ton of troubles, especially since the particular work they do faces more friction than most. There’s some very real natural barriers he says, but the value provided is so high. So high, in fact, that they’ve had 0% churn for at least the past four months. Danny says it’s his tendency even when he has the opportunity to exit one of his companies for a lot of money, to hang on in hopes for a big win. But he still hasn’t gotten the big win yet. Danny says he doesn’t think of work and his lifestyle as two separate things. He does them both, 24/7. Even if he goes out to do something fun, he still has his phone with him, and he doesn’t mind that. He creates his work-life balance on an hourly basis rather than a daily one.